WindLab™ is housed in a self-contained wind tunnel and includes a variable frequency drive for programming custom wind profiles. Its 3-phase generator is driven by a planetary gearbox. A unique aspect includes rapid prototyped airfoils that enable open-ended student design. This state-of-the-art wind power education system features custom on-board instrumentation created with LabVIEW™ and has an open architecture for student designed instrumentation and data collection. WindLab™ is a classroom-sized energy power plant built to last with aerospace grade components including an all alloy planetary gear box, 3-phase power generator, cut-away gondola cover, a stainless steel tower, and rapid prototyped blades. A wind turbine electric power plant designed for engineering classrooms, wind energy training, and research. 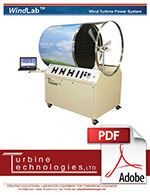 A programmable wind fan and scale wind turbine mounted in a rigid, mobile wind tunnel cabinet. Wind fan to be driven by on-board, variable frequency drive with panel mounted speed controller. Wind turbine to be industry-standard three blade horizontal axis configuration with adjustable/replaceable blades. Wind turbine to drive planetary gear configuration step-up gear box. Generator to consist of a three phase, DC excited 8 pole rotor, eight pole three phase stator with alternating current output. Unit to include operator panel-mounted generator voltage and current meters for each electrical power phase. Load to be supplied by three operator panel-mounted rheostats, adjusted equally for balanced load, or unequally for unbalanced load scenarios. To be supplied with a USB based digital data acquisition system complete with computer and user configurable data acquisition software capable of measuring, recording and displaying analog, digital and frequency signals, including: Wind Speed, Turbine Rotor Speed, Generator RPM, Voltage, Current, Power and Frequency. Equipped with calibrated transducers capable of measuring all elements required for data acquisition system. All metal surfaces to be stainless steel, anodized, or powder coated to promote durability and wear resistance. Provided with a comprehensive Operator’s Manual with design, operation, and construction information. Provided with summary operating checklists and safety instructions for all operating conditions. To be covered by a free two-year warranty. Wind energy education today for tomorrow's wind turbine technicians! The Latest News and Press Releases about WindLabTM electrical power generators.